The Daily Show With Trevor Noah Ratings Are In! New The Daily Show host, Trevor Noah, has been on everyone’s lips over the past week as he officially took over Jon Stewart’s position as the show’s host. Now, after a week of being on air, Comedy Central has released the figures of the show’s South African and American premiere episode – and Trev killed it! According to a press release from Viacom, the show’s first episode scored a rating of 2.6 – the highest rating ever achieved by Comedy Central in SA (the record holder until now was the Comedy Central Roast of Steve Hofmeyr, also hosted by Noah, which scored a 2.0 back in 2012). In the USA, the premiere of the show performed amazingly well, scoring a total of 7.5 million viewers across the simulcast of Viacom Media Networks brands. In addition, the premiere of “The Daily Show with Trevor Noah” was #1 series on Nielsen Social Guide for the day ranked on Unique Audience among all non-sports programming which is freaking amazing! The press release had some more impressive numbers, proving that viewers responded well to Trevor’s takeover. The second edition of the show scored even better, showing double-digit gains across the board vs. the premiere night telecast. The second episode, which featured segments on Presidents Barack Obama and Vladimir Putin at the U.N. and the attempts of Hillary Clinton and Ben Carson to pander to the youth vote, increased its audience by +13% in total viewers (1.2 million), and its ratings by +20% with Adults 18-49, +21% with Adults 18-34 and +55% with Men 18-34. Versus the final quarter of “The Daily Show with Jon Stewart,” the September 29 episode of “The Daily Show with Trevor Noah” saw ratings gains of +21% with Adults 18-49, +71% with Adults 18-34, and nearly doubled the Men 18-34 rating (+92%). On the multiplatform front, Noah’s full-episode premiere (has already been streamed over 750K times and clips from the episode have recorded nearly 4 million views across platforms. Socially, The Daily Show remained the #1 series in Late Fringe on Nielsen Social Guide ranked on Unique Audience among all programming. 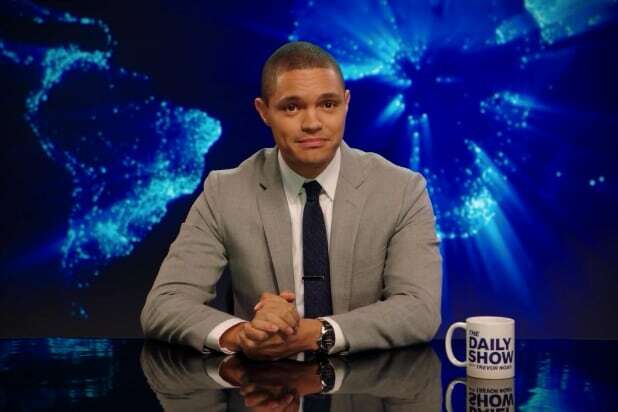 The Daily Show with Trevor Noah airs Tuesday to Fridays on Comedy Central Africa (DStv channel 122) at 21h00 CAT.